Adam Spencer Ross, who is almost 15, lives in New York City with his mom, and makes regular visits with his dad and step-family across town. He used to be an alter boy, is a member of the Young Adult OCD Support Group...and on, page 1, Adam discovers what it's like to fall instantly in love. I suffered along with Adam as he struggled to overcome his problems—lying, abusing his meds, obsessively counting and tapping—while trying to cope with his mother's problems—receiving threatening anonymous notes and displaying hoarding tendencies—as well as his step-brother's perfectionist intensity, school and therapy. Adam has some help here—his champion therapist, his dad and step-family, his best friend, and a kindly neighbor just when he needs one. He also had me, cheering him on throughout the book, especially when his compassion for those he loved overcame all else. This book is in my top 5 YA favorites of all time, and I didn't want it to end. — Jocelyn is a very special, very experienced TC bookseller, who loves young readers. Filled with moments of deep emotion and unexpected humor, this understated and wise novel explores the complexities of living with OCD and offers the prospect of hope, happiness and healing. Perfect for readers who love Eleanor & Park and All the Bright Places. The instant Adam Spencer Ross meets Robyn Plummer in his Young Adult OCD Support Group, he is hopelessly, desperately drawn to her. Robyn has an hypnotic voice, blue eyes the shade of an angry sky, and ravishing beauty that makes Adam’s insides ache. She’s also just been released from a residential psychiatric program—the kind for the worst, most difficult-to-cure cases; the kind that Adam and his fellow support group members will do anything to avoid joining. Adam immediately knows that he has to save Robyn, must save Robyn, or die trying. But is it really Robyn who needs rescuing? And is it possible to have a normal relationship when your life is anything but? 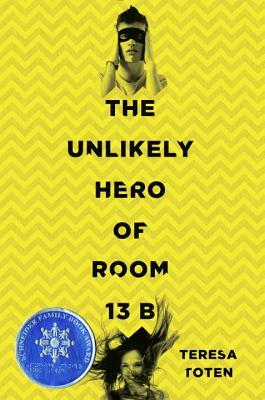 TERESA TOTEN won the ALA Schneider Family Book Award and Canada's Governor General's Literary Award for The Unlikely Hero of Room 13B. She is also the author of the acclaimed Blondes series, as well as The Game, The Onlyhouse, and, with Eric Walters, The Taming. Her upcoming novel, Beware That Girl, is a psychological thriller (Delacorte Press/May 2016). Teresa Toten lives in Toronto. Visit her online at teresatoten.com and on Facebook, and follow @TTotenAuthor on Twitter.